We break down what the third round of a dynasty startup draft might look like next season. We’re back! 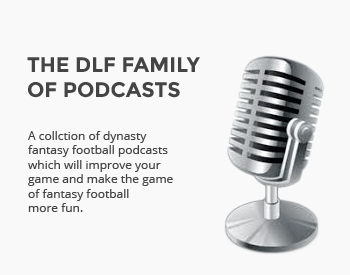 I took a few weeks to work on my Standard Dynasty Rankings series, and now I’m excited to get back to one of the funnest projects I’ve had the chance to work on here at DLF. 24 players are already off the board, and we have ourselves another set of 12 tantalizing talents in round three. Let’s get started. Here’s round three of our 2019 Startup mock! I’ve heard Adam Thielen’s career story a few too many times. From Division II to undrafted to the NFL to the Pro Bowl. It’s impressive, but it’s time to focus on his future rather than his past. Coming off a 1,200-yard season, and with Kirk Cousins coming in this off-season, I think that future is very bright. Yardage and receptions aren’t at all a problem for Thielen. He now just needs to find the end zone more often. If he can catch six or seven touchdowns in 2018, he’ll be a terrific target at the start of round three. Great post as usual, Bradley. I finally got my first championship last year after several years of playing FF. We had an interesting start to our draft this year where Chubb and Penny were available to me at pick 1.06 (acquired in a trade). I ended up taking Chubb, who I’ve been high on since he was in high school ha. I currently own Mixon, CMC, Alex Collins, Tarik Cohen, and Chubb. Keep going back and forth on if I should have taken Penny over Chubb. Based on my current RBs, do you think taking the guy who may take a yr or so to get the opportunity was a wise maneuver, or should I have taken Penny and his perceived excellent opportunity in 2018? Hey Jason! Great question. Congrats on winning that championship. As you said, that draft must have been very interesting indeed. I’m surprised both of those backs were available at that point. While I probably would have gone with Penny, taking Chubb was far from a bad move. You have three very solid backs already, and another one in Cohen who is fine as a plug and play. If you’ve liked Chubb for that long, there’s no reason not to grab him there. I actually thought he was a better pure talent than Penny, and as you know, he should come into 2019 as the starter in Cleveland. So overall, I don’t think you made the wrong move. I hope this helps. Thanks Jason! Yeah, it started Barkley, Guice Royce, Ronald Jones, DJ, and the I took Chubb. I think I may be overvaluing my RBs, but I hopefully have another shot this year! Thanks for the reply. No problem! Just my two cents, I don’t think you’re overvaluing your RB’s at all. You’ve got three starter worthy backs and one who’s a solid flex play. Suffice to say, you shouldn’t have any problems there. Best of luck in going for the repeat! Kind of disagree about Penny. Pete Carroll is known for benching big contract guys if a better player is available, and I would suggest the better early down runner is Carson, and the better 3rd down guy is Prosise. Remember, he sat Matt Flynn for Russell Wilson in his rookie season, after they gave Flynn $26 million for 3 years, and back then, that was a lot more than it is now. This will play out in Camp and pre-season, and make no mistake, if Carson clearly outplays Penny, Carson will be getting carries. If they are close, then I agree with you Penny will get every chance to shine, but he is not a good Pass Pro blocker, and Prosise is still there going in healthy, so I think Carroll will also realize Wilson can be protected better with Prosise without sacrificing anything in production on 3rd down, in fact I would submit Prosise is already the better option, if not even McKissic on 3rd down. Thanks for the insight, David! I think you raise some good points about Carroll’s style. Also, not for nothing, I loved the pun at the end. While I agree Penny will have to earn snaps, I don’t really see him having any trouble doing that. Chris Carson and C.J. Prosise are no pushovers, but I think Penny is the true number one as we grow nearer to the pre-season. We’ll learn more as camp gets underway, but for now, I’m not worried if I’m a Penny owner. Thanks for the comment, David! You clearly know your football! I can’t wait to see how that RB depth chart ends up shaking out. 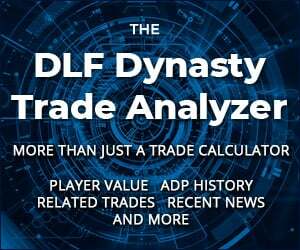 I think you’re too low on Corey Davis, all signs are pointing to a 1200 and 10 year to burst onto the scene as a legit dynasty WR. I love your belief in Davis! He should be a ton of fun to watch this year. And as it sounds, he’s been great so far this off-season. I don’t think he’ll quite get to 1200 and 10, but as with you, I just can’t wait to see him. I guess we’ll have to agree to disagree on him for now. Thanks for the comment, Leonard!